Obama State of the Union: the research behind his proposal on high-school dropouts. 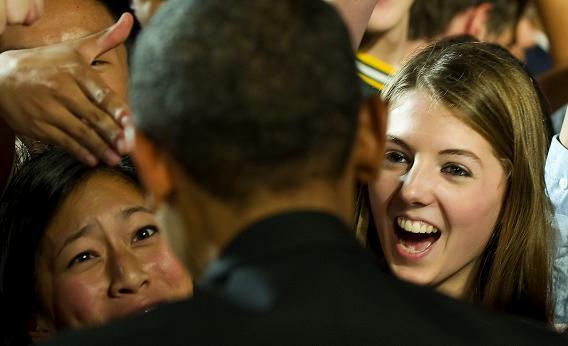 President Barack Obama shakes hands with students at Thomas Jefferson High School on Sept. 16, 2011. Currently, 30 states allow students to drop out of high school at either 16 or 17, so this would represent a significant change—one the president actually has no power to enforce, since state law governs most of the variables in education policy, including the ages of compulsory schooling. Nevertheless, Obama’s remarks could act as an agenda-setter. The proposal reflects the thinking of Alan Kreuger, a Princeton economist and chair of the White House Council of Economic Advisors. In 1990, Kreuger co-authored a study that found that because of variations in the ages when children enter school—some kids turn 5 the January before they begin kindergarten, while others turn 5 that October—students become eligible to drop out at different phases of their educations. The paper concluded that many potential dropouts stick out their junior or senior years of high school only because they have yet to reach the age at which they are legally allowed to leave school, and that such students eventually go on to earn somewhat higher wages than “early birthday” dropouts who were able to leave school as sophomores, for example. If every state responded to these findings by raising the compulsory schooling age to 18, there would inevitably be unintended consequences to address. Some low-income schools would be challenged by an influx of would-be dropouts remaining in the classroom. Schools should be doing more not just to warehouse at-risk students, but to provide them with engaging curricula that are relevant to their lives; that’s why, as I’ve written elsewhere, it makes sense to offer teenagers compelling career and technical education programs. This is especially important in light of what we know about dropouts: A 2006 survey from the Gates Foundation found that 81 percent wish their schools had done more to connect them to the world of work.